NOTE: This post contains affiliate links. It is not, however, a sponsored post. I purchased all my supplies and tell you the truth, folks! I told you guys I recently made a complete impulse purchase in buying my Cricut Explore . Well, I'll be damned if I'm not using that thing! (And having a ton of fun!) I decided I was going to go all-out with Harper's third birthday party invitations, and I did just that. Funny story... When I came up with this idea, I asked a group of bloggers I hang out with on Facebook (LOL such dorks) if they thought it would be possible to do a little girl's birthday party decor WITHOUT pink, purple, bunting or chevrons. Their answer was a resounding NO, and I guess I'm okay with that...since, well, these invitations obviously have ALL. THOSE. THINGS. Because I love them. I even got glitter in there. And scalloped edges. Clearly I am winning at this. And another funny story. When several of my blogger friends tried to convince me that I would be making these for myself and not for my daughter (because she would not remember nor care), I didn't disagree. But my good friend Farrah made it all worth it when she said, "No, but all the moms will be green with envy." Truth is that the RSVPs have started rolling in, and I've gotten lots of fabulous compliments on these. Considering that these are only my second or third project with the Cricut Explore , and I designed them all myself from scratch, I am really proud of how they turned out. So there's that. Practice makes perfect, I suppose. Now the big question is whether or not I will go to similar extremes in actually decorating for the party itself. I guess time will tell as the party is in a little over a week! And I've done no decor planning! I did buy some colored mason jars though...for...I'm not sure. But they seemed to go along with my whole anti-chevron, anti-bunting, anti-pink/purple theme. All the printed paper used for this project can be found here on Heidi Swapp's website. All my supplies were purchased at Jo-Ann except for the baker's twine which was purchased at local stationery boutique. What do you think? Is it worth it to go all-out for kids' birthday parties? Typography is HOT. 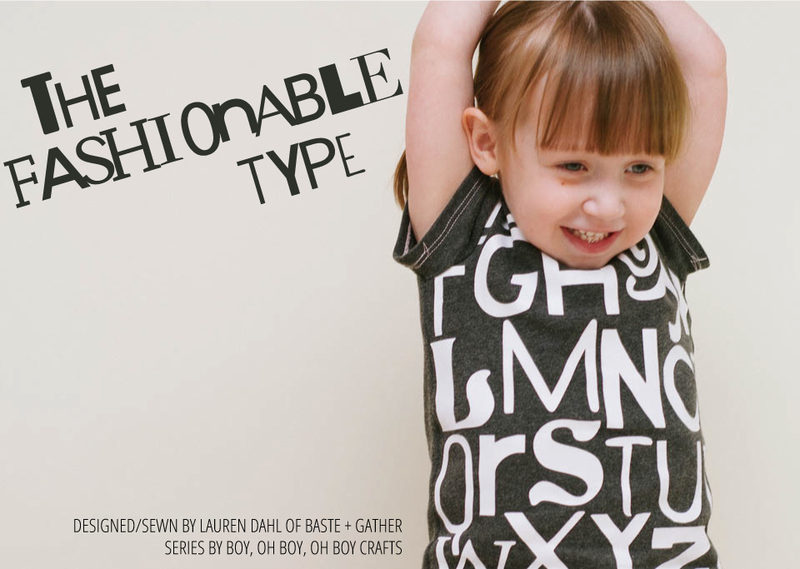 That's why I'm super excited to be a part of Stacey from Boy, Oh Boy, Oh Boy Crafts' The Fashionable Type blog series! First, let me tell y'all. This post contains affiliate links. If you click on them and buy something, I make a small commission on that sale. But I bought all my own supplies/equipment, and my words are true! Keepin' it realz, yo! The top was sewn using a prototype pattern for my soon-to-be-released knitwear pattern blocks (this was version 2 - I am on version 4 now!) from an upcycled, plain gray, thrift store tee. The skirt was created using adorable fabric from Jo-Ann Fabric and Craft Stores and no pattern - just a couple rectangles and some basic measurements and VOILA! First, I downloaded a bunch of free fonts from DaFont.com. Using Illustrator, I created an alphabet with said random fonts. I exported it as a .jpg, and then I measured the pattern block to see how large my graphic should be. Next, I pulled the .jpg into the Cricut Explore Design Space, sized it appropriately and loaded the machine with white iron-on vinyl. A few seconds later, we were IN BUSINESS. The Cricut Explore started doing it's thing just brilliantly, and a couple minutes later, I had a sweet iron-on. After pulling off the excess vinyl and using my handy Cricut Weeder to get into the small spots, I heated up my iron and started applying the iron-on to my fabric. Once the iron-on was sufficiently bonded (lots and lots and lots of hot ironing! ), I proceeded to cut out my pattern and sew the top. I was worried it would be hard to sew through the vinyl, but nope...easy peasy. I am not kidding when I tell you Harper wore this shirt for two days straight. Actually, maybe I should be embarrassed to tell you that. Oh well - I just love it when she actually WANTS to wear something I designed and created! Coincidentally, the "H" ended up right under her neck...which is cute since she likes to point out that "H starts with Harper" (as she puts it). She spent a good 5 minutes explaining to her teachers at preschool on Friday that I made her shirt...and then she pointed out all the letters she knows that what "they all start with." Harper's happy; I'm happy. And I love my new Cricut Explore. I already bought some pink iron-on vinyl and am anxious to come up with another project! What do you think? Do you love the typography trend as much as we do?! You can check out the rest of the awesome typographic projects by clicking the button below! Oh, and look! There's a sweet linky party for you to check out and get inspired (or add your own typography-inspired project)!